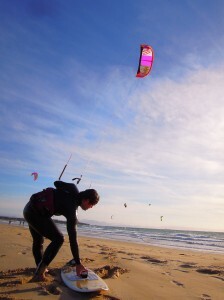 I landed my glider on the beach, turned to the bar, and gave Juan the signal: forearms pressed together and hands split into Y-shape of a cocktail glass. This was the cue for Juan to start making our margaritas. 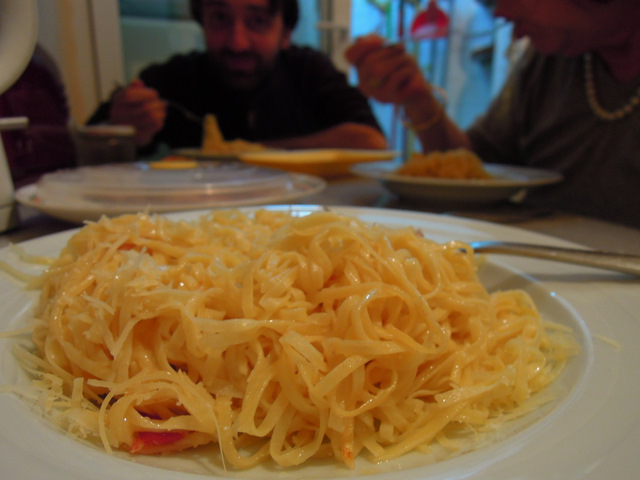 He knew the details: Allison’s without salt; mine with. Both on-the-rocks. 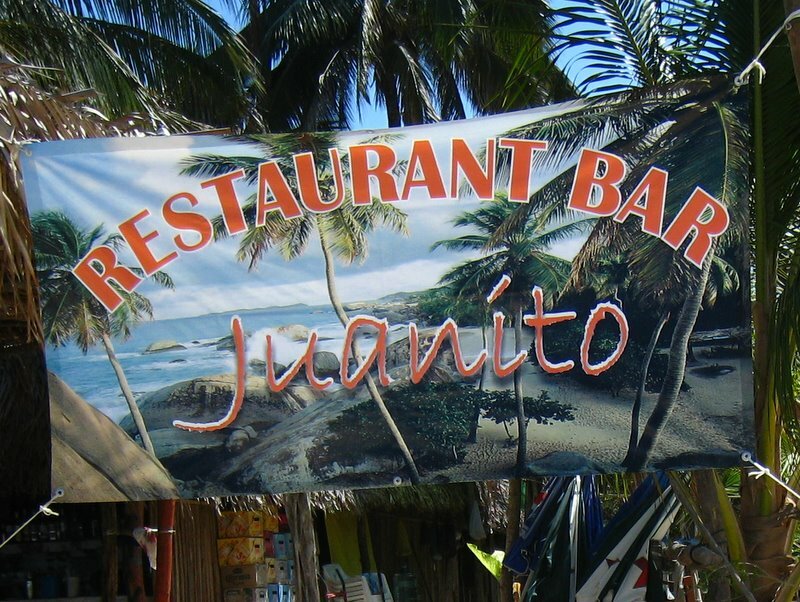 A rumor circulated the Mexican village that Juan washed the cocktail glasses in the dirty lagoon behind his restaurant. We didn’t care. His bar was closest to the landing zone and after the steep climb to launch and our flights, we were too lazy to shoulder our gliders another step. So what if just a few trudges away, crisp-shirted waiters served up meals in pretty carved out pineapples. Like most pilots on a flying vacation, we had a routine. The top launch was good at noon, and the sock straightened out on mid-launch around 2:00. We’d take a couple flights, then wash the adrenaline down with a margarita. Sometimes two. I shook the sand out of my wing, packed it up, and slogged over to a beach chair. Juan flip-flopped toward me in his dirty apron and our two margaritas balanced on a tray. He set the glasses down side by side. “Gracias!” I said, lifting my glass. I took a sip. The rock salt abraded my lips slightly. Juan’s margaritas were the best in the world–cold, salty, gritty, like the sea embodied in a cocktail glass. Allison trudged over, dropped her glider, and stretched out on the chair next to me. Out in the bay, fisherman threw nets from their boats and a flock of birds fluttered over us like a fresh white sheet. I’d never felt a more uncomplicated happiness in my life. We drained our margaritas and I took the empty glasses back to the bar. I fished a 500-peso note from my wallet—the smallest bill I had. Juan slammed the cash box down and glared at me. “No change!” He went on to berate me in fast Spanish. My mood dropped like a shot pheasant. “Fu-fuu …Forget this place!” I yelled. While most days Juan was pleasant, one out of ten times he would mysteriously erupt like this. At first I was bewildered, then angry. It felt unfair. We were his best customers, dropping 80 pesos a day for a month straight. We put up with his grimy bathroom facilities—the seatless toilet and the lock-less door, the scummy hand-washing barrel. We endured the love-sick ranchera riffs that wept nonstop from his jukebox. Other pilots gave up on his place long ago, swapping their flight stories next door at Domingo’s instead. “We’re never coming back!” I yelled. “Adios!” he said waving me off. Juan pandered to no one. This wouldn’t be the first time we tried to boycott Juan’s bar. Usually, by day four of the boycott, our laziness would exceed our anger and we’d end up in his beach chairs again, enduring the ranchera music and quaffing down his fantastic margaritas. Juan would pretend nothing happened. “Margaritas senoritas,” he’d say placing our glasses on the table. In a matter of days he’d blow up at us again and the cycle would continue. We didn’t know much about Juan, but he seemed to have a soft side. Like a crusty-version of St. Francis of Assisi, he tended a variety of animals—a stubborn mule, a brood of chickens, a few caged parrots, a dog that fetched rocks, and a cat with a freakish nervous tic. He’d even endeared himself to a wild pigeon by pouring a small pile of seed on the end of his bar each day. Unlike the other bar owners, who closed up and went home for the night, Juan lived with his two teenagers and wife in a large canvass tent behind his bar. The local villagers patronized his placed in the evenings, often staying into the night playing cards and plunking pesos in the jukebox. Sometimes, when standing at his bar, Juan would pull the canvass door aside and we’d glimpse his private world. Inside, an old television crackled on an upturned crate. His wife would be in there watching Mexican soap operas. She never spoke. She never came outside. I remember Juan sitting in a chair, his head tilted back slightly and watching. He seemed almost wistful. 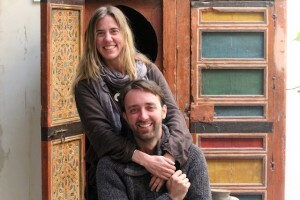 It wasn’t until our third flying season that we learned that all this time Juan’s wife had cancer. Behind that heavy canvass door, between mixing our margaritas, he’d been tending to her illness. He’d sometimes close the bar altogether, and take the water taxi ride to hospital in Puerto Vallarta where his wife was receiving treatment. His temper still flared, but we were more patient. Now we understood he had bills to pay. His jukebox was gone that year, replaced by a small handheld stereo. The owners of the nearby bars were complaining that the loud ranchera was putting off the tourists. Juan’s expression grew hard and serious. He seemed to emigrate between two worlds that season—the one outside his door where we laid in the sun drinking margaritas, and the dark dank insides of his canvass hut, which may as well been a different country. The geography of our paradise—the palm trees, the macaws, the cocktails–was the geography of real life for him. Our vacation was not his vacation. We returned for a fourth season. Juan was there as usual, tending his brood of chickens, the tame pigeon, the caged parrots, the stubborn pack mule, the stone-fetching dog, and the nervous cat. But something had changed. Weeks went by and he didn’t yell. We didn’t boycott. We found out that his wife had passed away that winter. Though he’d cared for her with great love and fidelity, it was obvious that his burden had grown less. He was laughing with his patrons, drinking Pacificos, and playing rowdy card games into the night. I suddenly got it: all this time, Juan wasn’t jerk. He was just a person under huge duress. “How could we not have known his wife was so ill?” I asked Allison hurling a stone into the surf for Juan’s dog to fetch. With the Godlike views afforded by our wings, it sometimes felt like we knew everything about that place. We knew how thermals formed over the first-blooming Primaveras in March, how wind spilled over certain ridges at noon, and how to decipher wind lines on the ocean. We could see straight down into the village and all the way across to the Marietta Islands. But our big view wasn’t always the best view. Details got lost. It was good to arrive last season and see Juan happy. We landed our gliders and gave him the cue. He disappeared into the darkness of his hut and came out with a handful of shiny green limes to make the best margaritas in the world. “Dos Margaritas Simpaticas!” he laughed, setting our glasses down. And they truly were. There have been times when I’ve wondered where the line lies between long-term travel and homeless. The borderlands between the two lifestyles can be thin, and sometimes I’ve wondered if there is a type of homeless person who doesn’t think of himself as homeless at all, but rather on a very long camping trip. I don’t have a home-per-say—just a 10×10 storage unit. But I don’t consider myself homeless. Even as we drift from place to place on-the-cheap and rootless, I tend to think of myself as on a Grand Adventure. But occasionally I’m shocked into a different perspective: I’m walking with my backpack down a dumpster-lined alley enroute to a cyber-café, and someone directs me to free breakfast at the church; Or I wake in our truck, look around, and realize we’ve been living with a rat for two months. The glue traps are overturned and stuck to the rug, the spring-loaded snappers are licked clean of their bait, and the live trap sits untriggered with a half-nibbled crouton. I get out of bed, pull on a shirt, and flinch at a newly chewed hole in the shoulder. Is this my life? This sensation came up most recently when planning a trip to meet friends in Oludeniz, a resort town on southern Turkey’s Mediterranean. 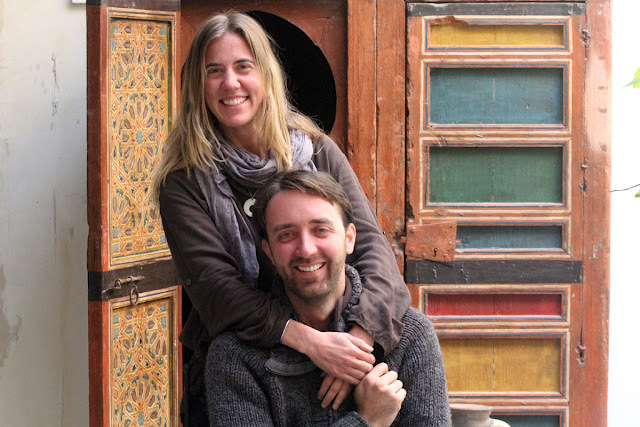 We were happy to pay the cheap airfare, but after living in a van, are unused to paying for habitation; Andy perused dozens of hotel listings and quickly entered the seven stages of grief; the costs were uniformly high. Then, suddenly, he perked up. I squinted. The screen flashed with photos of rose petal-scattered bedspreads, flutes of champagne. 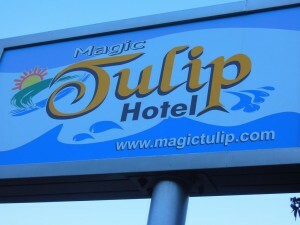 The Magic Tulip Hotel. “Impossible.” The shoddiest place I’d found in Oludeniz was three times as much. “There’s gotta be a catch,” I said. Andy Skyped the agency and the price was confirmed. He was frothing to book; I was fretting. Hotel from Hell, one read. 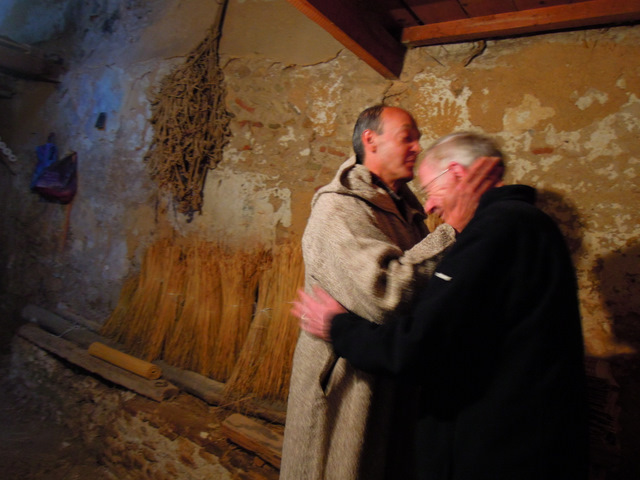 The rooms were comfortable … except for the beds, said another. I spent 4 days in hospital – I’m convinced this hotel played a part in the stress we had to endure as my health previous had been exemplary. I would honestly say you would be stark raving mad to choose this hotel!! Had our standards really sunk this low? I blamed Andy who always gets suckered by the thrall of false economies. I remembered the cheap flight he once found us that arrived at 3 a.m.–after the public transport had shut down. We ended up paying $60 for a taxi. And then there was the outdated GPS he bought “for a song” which directed our truck right into the ruts of The Oregon Trail. We arrived at the airport near Oludeniz the next morning. I sulked at the baggage claim while Andy sang Madonna’s “Holiday.” We grabbed our gliders from the conveyer belt and exited the airport where we’d catch a van into Oludeniz. “I’ve never had a sign with my name on it,” he gushed. We heaved our bags in the van and were off, traveling the windy mountain road curves to Oludeniz. Andy smiled wildly while my eyes teared at the prospect of 16 days of cockroaches crawling across my face in the night, 16 days of mice and mold and 16 days in paradise without the paradise. He would want to stay. I would want to move. We would fight. By the time the van was speeding down the final stretch of highway toward the Roach Motel, my life had arrived at a crossroads: I was ready to get a real job and make real money–to start going on proper vacations. But who would hire me now that I’ve spent my “earning years” squatting in truck stops and borrowed houses? I exhaled. A gold rating? From Portland?! My (almost) home town? I pulled the reins on my encroaching optimism. The certificate was dated 1998. We ascended the steps found room 309, unlocked it, and opened the door. Granted it wasn’t like the photos: there was no champagne, no rose-petal covered bed. But there was also no mold blackening the walls, no evidence of rats, soiled sheets, or cockroaches. 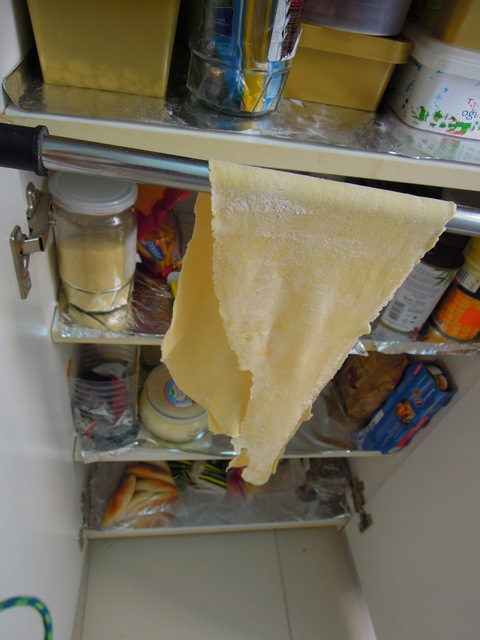 Clean towels hung from the bathroom rack, and the toilet paper holder was loaded with a brand new roll. But what was with the hostile Trip Adviser reviews? It was a mystery. 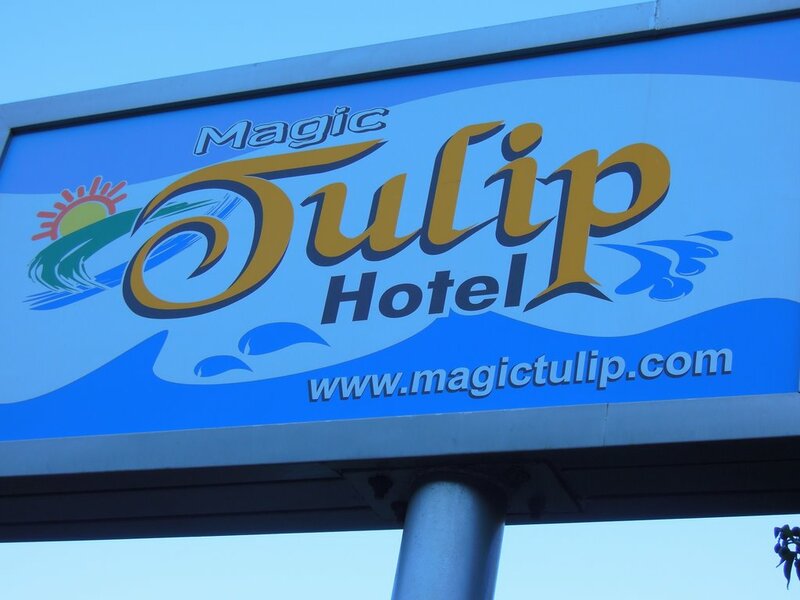 Either the motel had pulled its act together since they were written, or someone had a serious vendetta against The Magic Tulip. Either way, it definitely illustrated some of the problems with TripAdvisor. But that’s a whole different blog. After a brief bask in the glow of Being Right, Andy—who gets anxious at settling anyplace without wheels—did something unprecedented: unloaded his back pack into a dresser drawer. Let there be no doubt: For $10 per night, we were home. It would be easy to pass over Youssef Bouhlal’s tiny shop in the Fez Medina. Its modest offerings of dried lentils, white beans, garbanzos, oil, and milk are unremarkable among the competing sights of souk. But like the plain facades that cloak the ornate interiors of the Medina’s mosques and medrassas, the splendor of Bouhlal’s shop is hidden. I wouldn’t have known about it without my expat friend, Sandy McCutcheon, who introduced me to Bouhlal’s shop on one of our Medina strolls. 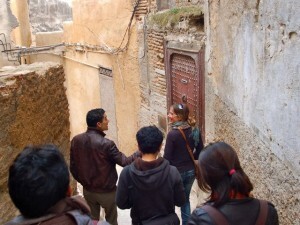 “This is the best place to buy coffee in the Medina,” he said, placing his order for a half-kilo. 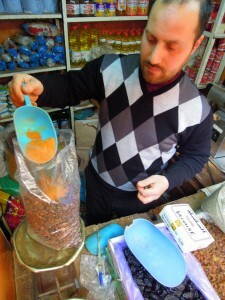 When the grinder switched off, Bouhlal held out a scoop of the coffee for us to smell. 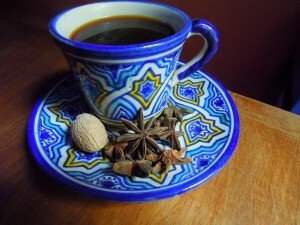 Inhaling the rich aromatic spices invoked cozy memories winter mornings, Indian chai, and holiday treats. Although Fez is full of sidewalk cafes serving espresso drinks, spiced coffee is rarely on the menu. Moroccans mostly prepare it in the home. You can buy bags at several places in the Medina, but Bouhlal’s blend stands out both for its well-balanced flavor and its low price: just six Euros will buy you a kilo. And while blending your order, Boudlal also can converse about English literature. He’s studied the works of James Joyce, Joseph Conrad, and Herman Melville. His coffee is as well-traveled as his mind. Guests to Bouhlal’s shop invariably buy a stash to take home. “My coffee has traveled all over the world,” Bouhlal said, twirling a bag of sesame seeds closed. Combine these spices with quality coffee beans and grind. Brew in a stovetop espresso maker or percolator of your choice. Cream and sugar transform this spicy delight into a dessert. Prepare to be addicted.